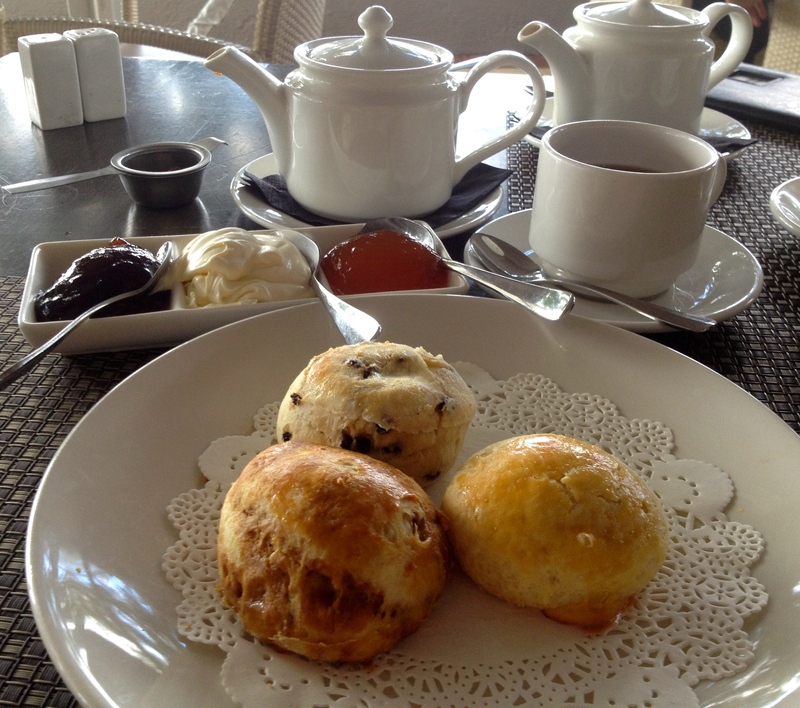 Scones at the Brasserie by the River at Stamford Plaza in Brisbane nearly didn’t happen. My friend and local scone source had called up, was called back and told to come by for scones anytime between 9 and 2.30pm. We arrive at 1.30pm, just as diners are finishing up with the buffet lunch and a wedding is being set up outside in the garden overlooking the Brisbane River. After much too-ing and fro-ing (no one could decide who was to blame for the misinformation? ), we are allowed in but are advised that we must be out by 2.30pm, difficult, as our scones don’t arrive until 2.30pm. We are fussed over and a lovely man is given the task to look after the ladies who refuse to leave until they have had their scones! The three flavours; treacle (an instant winner), white chocolate and currant, are straight out of the oven. They are just the right size for afternoon tea, without being too filling, and are served with lashings of apricot and strawberry jam and double thick cream. This spread was definitely worth waiting for, and couple it with an outside table overlooking the boardwalk and the Brisbane River. My advice to call a few times and check with a couple of different people at the Brasserie, and don’t let them turn you away especially when you have been given the information. Tea: A good variety of loose-leaf teas served in a nice teapot. Overall: When the staff knows what they are doing, it’s a lovely place by the Brisbane River. Located in the basement of a fashion, home and giftware store, the cafe is utterly feminine. Far away from the city crowds, it’s a quiet relaxing haven for an indulging hour or so. The jam is good but nothing extraordinary and the scones light and just the right size for a snack without deterring you from shopping for that swimsuit. The thick whipped cream is laced with Cointreau, which may give you a bit of encouragement to give the credit card a workout! Nice touches with the flower and doilies. Tea: A variety of teas served in good sized teapots. Overall: Feminine vibes and presentation. Situated on the gallery level of the 1923 built Brisbane Arcade, Room with Roses Cafe is a über feminine chintzy cafe for ladies who like their morning and afternoon teas. A vintage vase with a fresh rose is on every table in the open plan cafe, allowing you to absorb the arcade, and it’s also far from the madding crowd, so is a peaceful respite in the middle of the CBD. It’s early in the day so the scone, which resembles and tastes more like a raspberry muffin than a scone, is super fresh. The homemade raspberry jam, which is also for sale, is rich and fruity and the cream, although not really thick, is good. If you’re having the same tea as your companion, a large pot is shared. 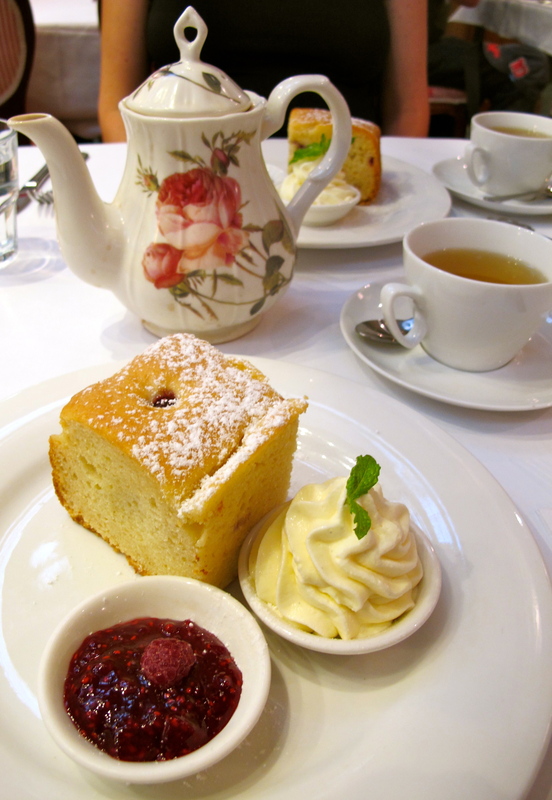 Throw on your most feminine attire and gather a group of female friends for a lovely place for a Devonshire Tea. Tea: A good variety of loose-leaf teas served in a spectacular teapot. Historic Ormiston House was the home of Australian sugar industry pioneer, Captain Louis Hope and dates back to 1862. The spacious gardens and views over Moreton Bay are lovely and the insight into the sugar industry interesting. Now surrounded by suburbia, you wouldn’t think that once this was a thriving sugar plantation with a homestead with magical views of the distant sand dunes of Moreton Island. 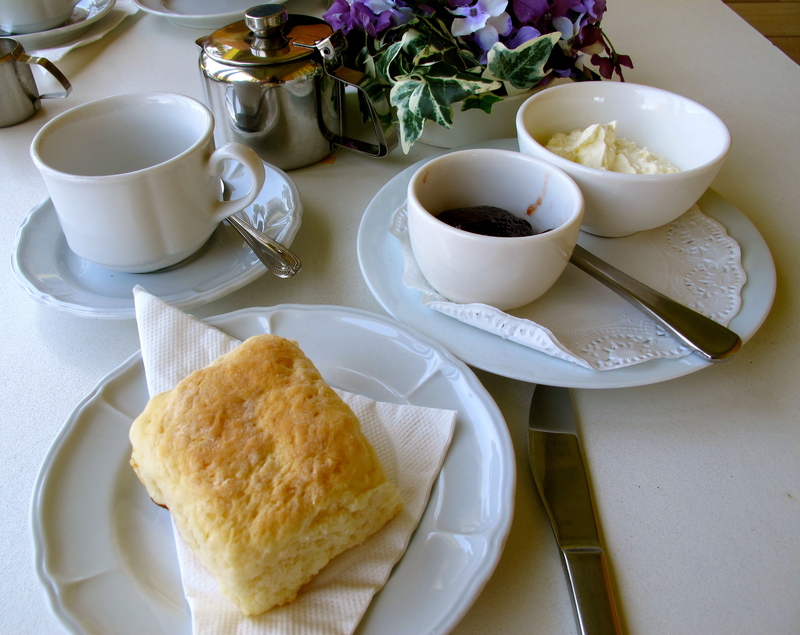 Once you’ve had your fill of history, adjourn to the wrap around verandah and overlooking the camellia and azalea gardens for a Devonshire Tea, which is prepared and served by senior volunteers. The serving of one CWA-style baked scone, whipped cream and your standard supermarket jam is a steal at $5 so why wouldn’t you try it? And makes for a splendid afternoon outing in Brisbane. Ormiston House is open most Sundays, 12 noon -4.00 pm and incurs a $5 entrance fee and is well worth the visit if you are interested in Brisbane’s colonial heritage. Tea: A few tea bag choices for a small pot. Overall: Afternoon tea reminiscent of yesteryear. Passiontree Velvet is not in your face when it comes to signage. It’s one of those open plan cafes that position itself in the middle of the mall. It’s macaron tower and counter filled with just enough exquisite bite size cakes that gets our attention, and of course tables of customers indulging in high teas. The place isn’t full, but we’re told that there aren’t any teapots left and do we mind having an endless cup of tea instead. I find this disconcerting, a café that specialises in high tea, isn’t even full, and doesn’t have enough teapots? Not a great start. We say we’re happy to wait for teapots, and in the end it doesn’t take long. The plain and fruit scones are bite-size, small and crispy and although they are better than average, they are nothing unique. The jam is better than average as well, but the cream, which is thick dollop cream is the clincher in making this a pleasant spread. Currently there are franchises at AMP Macquarie in Sydney, Robina Town Centre and The Strand in Coolangatta in Queensland. Tea: Good quality Harney & Sons Fine loose-leaf tea is served in a plunger teapot. 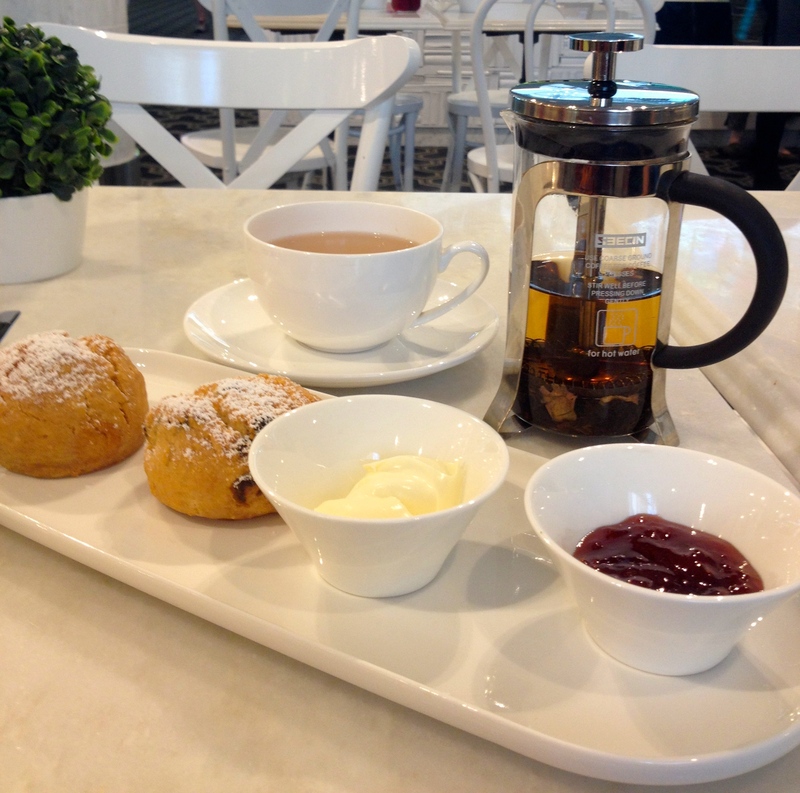 Overall: A great option if you are shopping at Westfield and have a hankering for scones. 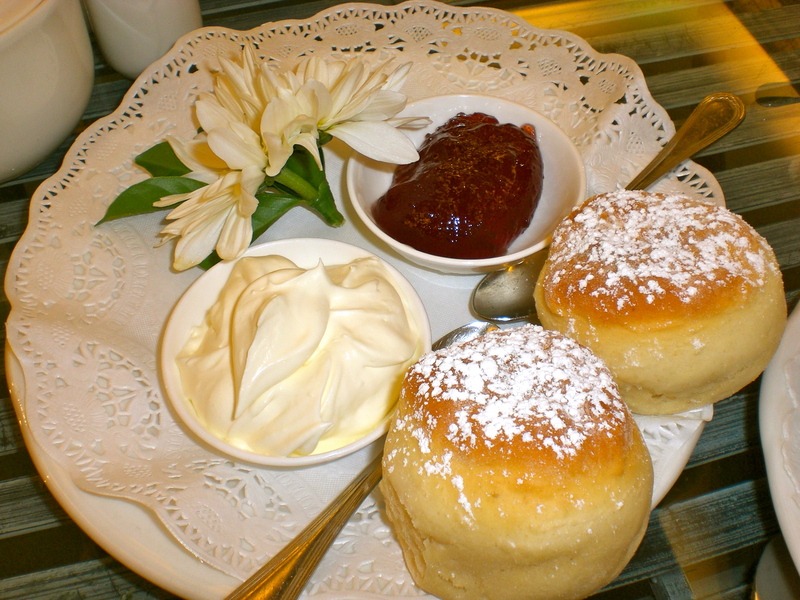 When I suggested to a friend who has lived in Brisbane for more than 25 years, a Devonshire Bush Tea at Redlands IndigiScapes Centre, she had no idea what I was talking about. Redlands Shire is the gateway to North Stradbroke Island and I guess, for inner city Brisbane folk, is not really a place they hang out in. So an enlightening afternoon followed. The IndigiScapes Centre is an environmental education centre and has botanic gardens featuring only plants locally native to the Redlands area. There’s a Visitor’s Centre where you can pick up brochures on the area and Stradbroke Island and a gift shop selling indigenous themed products such as lillypilli and rosella jams. The menu leans towards dishes using indigenous herbs and spices, but also offers a variety of café fare. 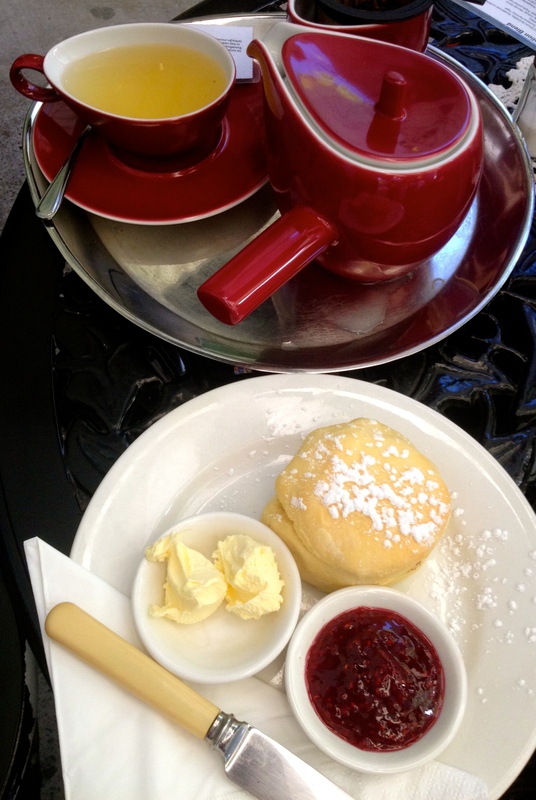 The stand out is the Devonshire Bush Tea that along with their plain scones offers a lemon myrtle variety. I suggest the latter as the plain are heavy, dry and crumbly, plus the subtle lemon myrtle flavour pairs beautifully with the array of jams available. Choose from flavours such as quandong, Davidson plum, strawberry and wattle seed, and of course lillypilly and rosella, as well as mango and pineapple. The cream is fresh but very light. Although we snagged a table after the lunch rush, bookings are advisable. Tea: An interesting selection of loose-leaf teas served in a lovely cast iron teapot. 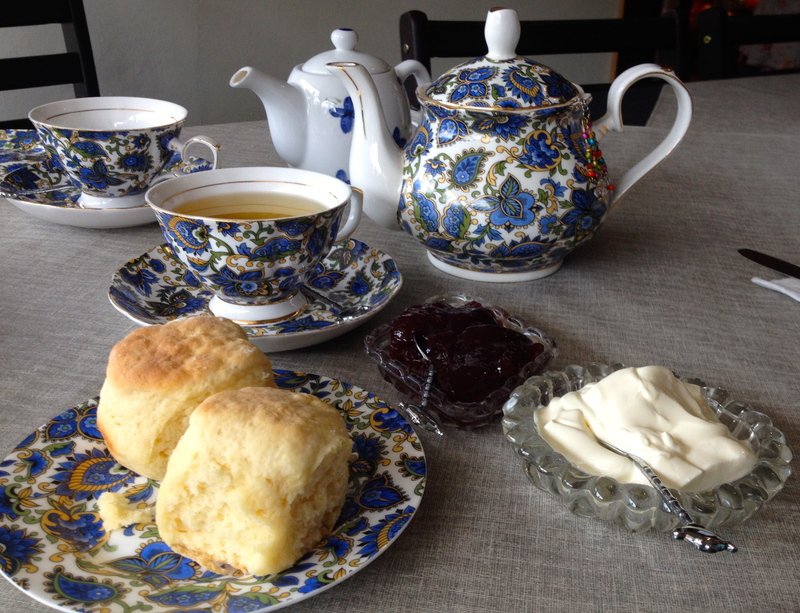 I suggest the wattleseed tea, which pairs well with the lemon myrtle scones. Overall: A lovely garden setting with an indigenous twist. Dandelion & Driftwood’s mission statement is to deliver high quality coffee and teas to Brisbane’s northern suburbs. A barista stands behind a coffee cart on the footpath, while customers who want to hang around squeeze into the Tea Garden or cosy up indoors. If you can make it past the cakes, jams, teas and coffee beans for sale, you’re in for a real treat. 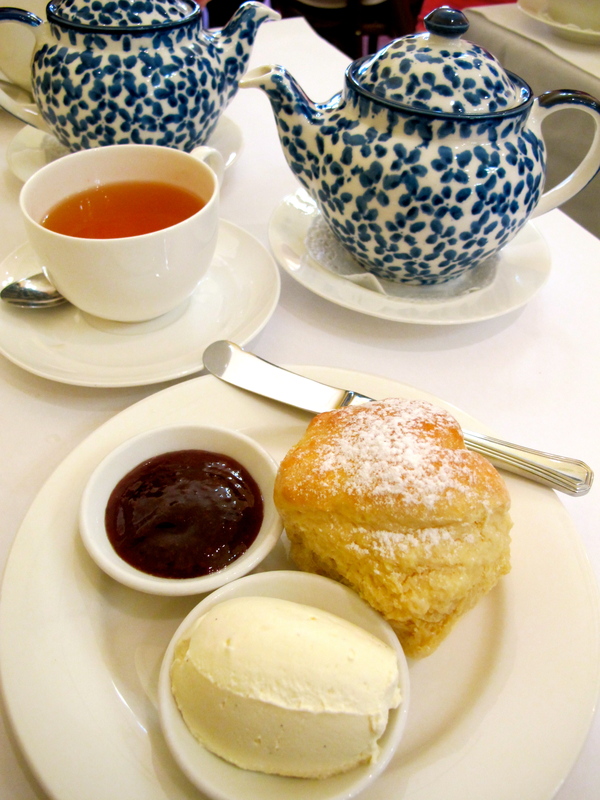 The scones are creamy, buttery and silky smooth – can a scone possibly be described like this? Wowser! I could eat a batch of these lovelies. The Meander Valley double cream has the consistency and taste of clotted cream, but the waiter says that some batches of the same cream can be more like double cream, so I guess it’s a lucky dip. The Paul Grainger raspberry jam is exquisitely rich and super thick with raspberries, a sit shold be. 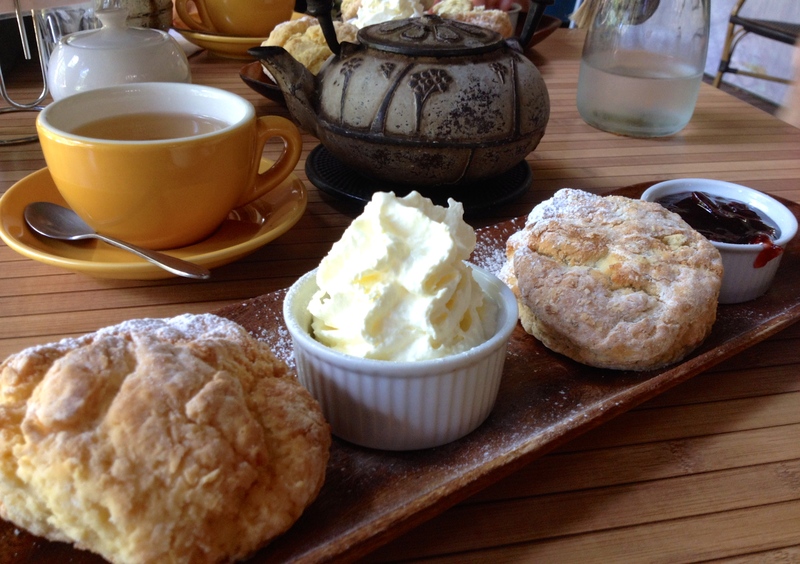 With high quality scones, jam and cream, it won’t be too long until DT lovers start flocking to Dandelion & Driftwood. Tea: An excellent tea menu of loose-leaf teas are sold under the ‘Dandelion and Driftwood’ label and served in a hip teapot and cup. Each tea as well as coffee comes with a small laminated card with a beverage description and brewing directions. Overall: Although it can get cramped, this café does every aspect of a modern Devonshire Tea excellently! 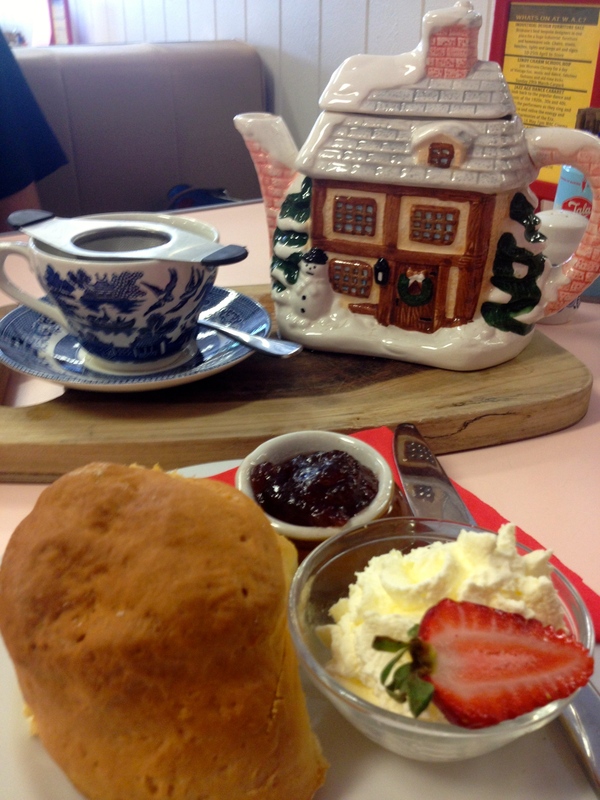 Situated in a lovely old style building, circa 1925, Queenies Traditional Tea House is a busy tea watering hole in the heart of Nundah, in Brisbane’s northeast. The extensive tea menu has me pondering over the endless choices for far too long and needless to say I leave the cafe with a few new teas to add to my collection. The generous sized pots of tea seem pricey at $7 but they’ll keep you going for an afternoon of chatter. The traditional scone (plain) is served with super thick clotted cream and lovely rich jam, and the scone is fluffy on the inside and slightly crispy on the outside. My tasting companion orders a date scone served with cinnamon butter and says it is exceptional! The crisp white tablecloths and 1920’s background music is a nice touch. Tea: An amazing array of black, green and herbal teas – of course, it’s a tea shop! Overall: A semi-quaint English morning or afternoon tea shop in suburbia. Tucked away from the main road on an unassuming block of land and in a building that once was a veterinary practice, Devon Pixies is one of those hidden gems that won’t disappoint. 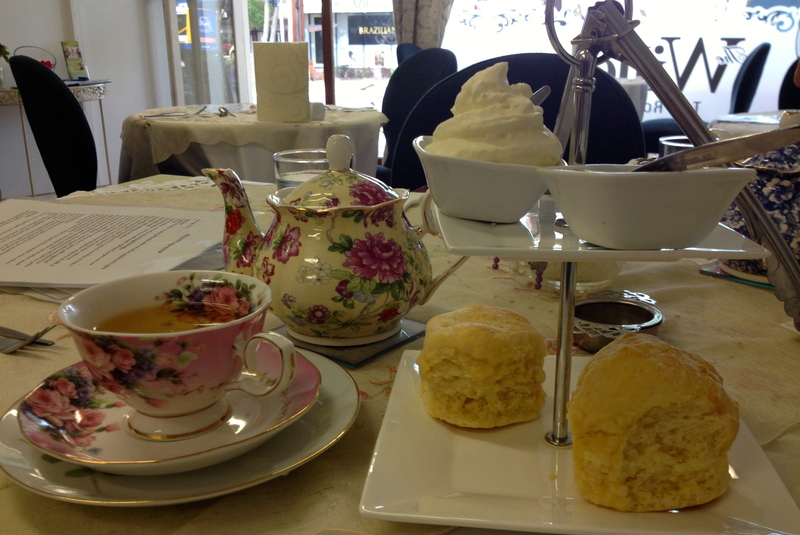 Pink and pretty, Devon Pixies is not decadent in a five-star hotel High Tea kind of way but instead fun and quirky. Hot pink plastic chalice-looking water cups sit on the tables along side fine bone China trios. A dish of pink and white marshmallows, although we leave untouched, adds to the indulgent experience. It’s not all fluff and pink feminine touches; the goodies are what keep visitors coming back. 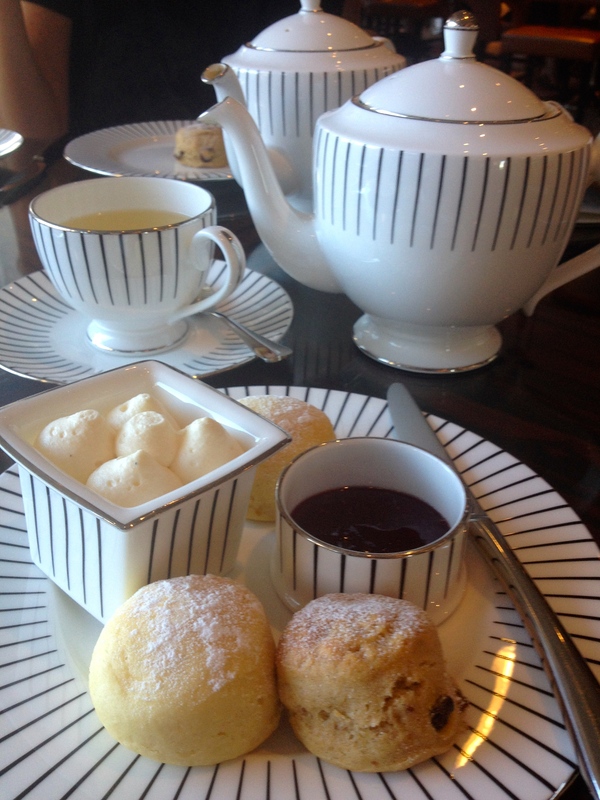 The scones are fluffy with a creamy texture and are accompanied with a homemade chocolate truffle. They are definitely more-ish, and if it weren’t for the list of cafes I plan on visiting, I would order more. The raspberry jam is thick and pairs nicely with the super thick dollop cream. Devon Pixies is set up to create a social vibe, with a hat stand loaded with hats and scarves for funny photo opportunities. 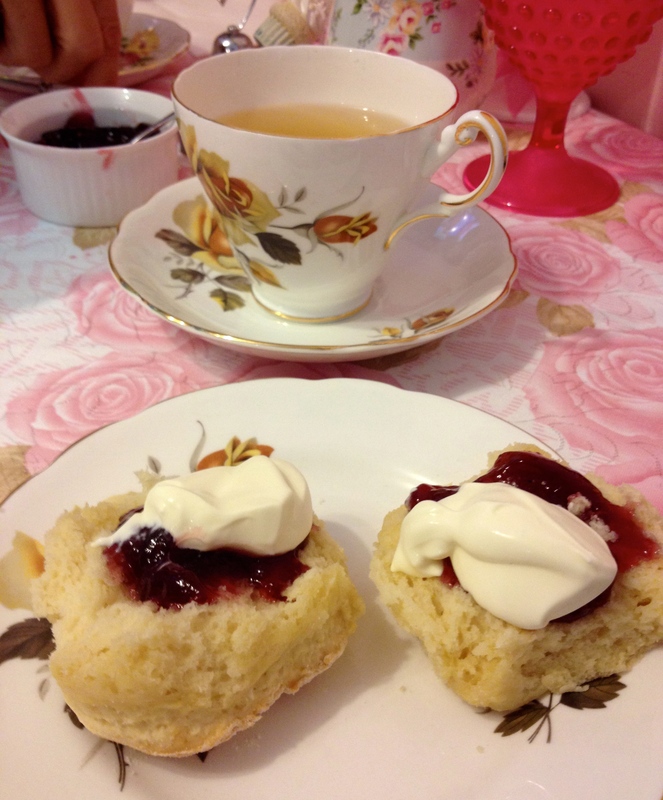 It’s the perfect venue for a birthday, bridal or baby shower, or any event where the peeps love a good scone. Tea: A selection of T2 loose-leaf tea served in a pretty teapot to go with the dainty fine bone China trio set. Overall: This is one place you don’t want to miss! Don’t visit this small cafe in the southwest of Brisbane for its decor, which includes plastic lavender in vases and bright red tablecloths. 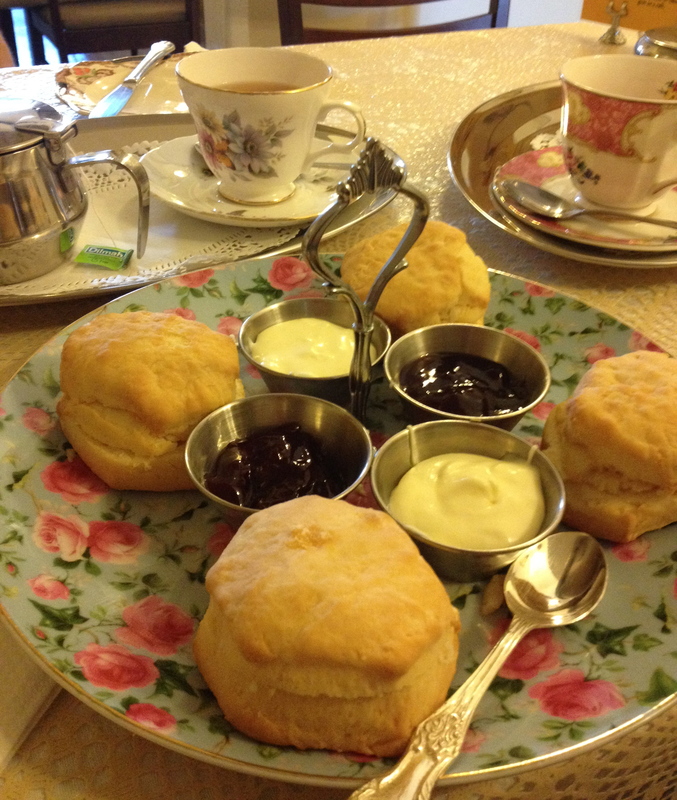 But do go for a good quality Devonshire Tea served with home-baked scones and fruity homestyle jam. Drinking tea out of a proper tea-cup and saucer is always a big plus for me and adds to the experience as does a brilliant tea menu that diverts from the usual Earl Grey and Peppermint options. The serving size of both the jam and cream is ideal for the size of the scones, as so many cafes underestimate the proportions. My friend has a penchant for the Dutch-style plates so is even more content with her morning tea which just gets it all right in a relaxed and old-fashioned way. Tea: A good selection of loose-leaf teas served in a big pot. Overall: The perfect ‘little old lady’ hangout. Formerly Vintage Aura Cafe, Lily’s on Birdwood has had a revamp. Owners Brad and Julie have alerted me to their revamp and that they have moved the tea room to the other side of the shop. It is now light and airy with a bit of a French feel to it, and I’m assured that the scones are still the same. Work up an appetite perusing Vintage Aura’s three rooms that are chock-a-block with giftwares. The scones are baked daily and served with lashings of strawberry jam and double thick cream, and there’s a huge blackboard listing the teas available. I love the teaspoons, which have little teapots on the ends, and the cute tea infuser that dangle over the edge of the teapot. The crockery is a huge hit with my buddies. Tea: A good selection of loose-leaf teas served in gorgeous teapots. We loved the tea infuser. Overall: A true blue tea room feel. Upon entering, The Willows Tea Room & Cafe looks like its name suggests – a tearoom! It’s quaint, feminine and what you expect a tearoom to look like. There’s a semi enclosed courtyard alongside and a cosy room out the back that’s designated especially for the prebooked High Teas. We have the attentive and friendly service all to ourselves, and relish it. After spending too much time pondering the extensive tea menu, the three of us decide on my all-time favourite brew, lime and coconut sencha. The teacups and teapots arrive to gasps of ‘oohs and ahs’ as we admire their prettiness. The scones, jam and cream appear on two-tiered serving plates, which impresses its guests again. The scones are lovely, soft and creamy, and we’re told the owners’ brother who is a chef makes the divine strawberry jam. The only downfall is the whipped cream, which is a bit too light. Tea: Oodles of loose-leaf teas served in pretty teapots. Overall: A pretty tea room for those who love their teas. Woolloongabba Antique Centre is brimming with funky retro and vintage furniture, jewellery, clothing, and home and kitchenwares. The range is so extensive that it can take several hours to make your way through the individual shops that are housed under one warehouse-sized roof. Collectors of all that’s old is new again, will love the variety and quality of what’s available. All this shopping can make you hungry, and conveniently located within the antique mecca is a 1950’s Milk Bar style café, with booths and all. I instantly love it as I have a soft spot for American style booths. Another delight is the kitsch but cute teapots in the shapes of houses. They are all unique in style, and have my friend and I squirming in delight. A lot less impressive is the food. The scone, jam and cream are average. The scone is fresh but doesn’t make an impression on us, along with the ordinary strawberry jam and the super light cream. The fresh strawberry is a nice touch, but the real winners here are the teapots. Tea: A small selection of T2 loose-leaf teas served in gobsmackingly gorgeous and unique ‘house’ teapots. Overall: A quirky 1950s cafe surrounded by an antique/bric-à-brac shopping haven. Hi, we are the owners of Vintage Aura, the gift shop and tea room at 815 Logan Rd Holland Park. We have revamped the place and have moved the tea room to the other side. Renamed Lily’s on Birdwood, it is now light and airy with a bit of a French feel to it. However the scones are still the same and we would love you to drop in some time and sample them again. Thanks for the great review you did in 2013 and look forward to seeing you soon. Thanks for the update. What a shame! I was in Brisbane a couple of weeks ago and don’t know when I’ll be in town again. I’ll amend the review and add your changes and next time I am in town I’ll try and drop by. Thanks again, it’s sounds wonderful! Thank you for showing places which I had no idea existed, even though living here for 50 years. I had almost resigned myself to the fact that a country drive was the only way to get a good dev tea break! Although prices were on some reviews, it would be very helpful to have prices on all. I have been charged some rediculous prices for scones, I believe that the decor should be a contributor to returning to the cafe, not a reason to overcharge. 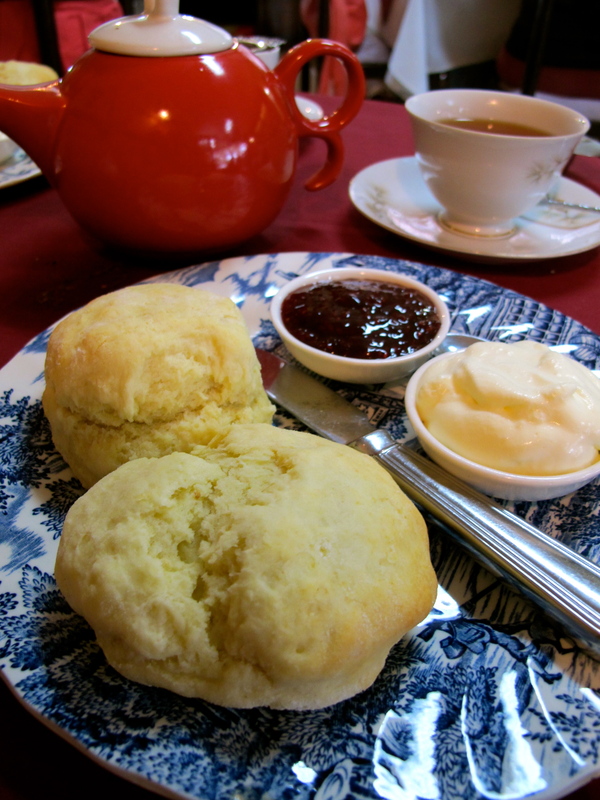 Yes, you do need to dig deep in Australia to find scones, unless of course you are in country areas that attract a lot of tourists. I only put prices on the overseas reviews, to give readers an idea of price, but the prices change according to the exchange rate. However in Australia, I decided against it as cafe prices can change regularly and it is a review of mostly Australian sites. Anyway, thanks for reading and your comments.